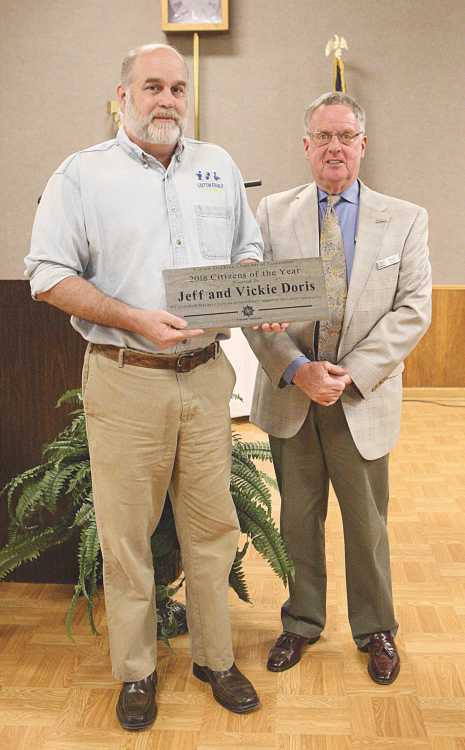 Jeff and Vickie Doris were named 2019 Linton-Stockton Chamber of Commerce Citizens of the year. Jeff Doris, left accepted the award from Mutual Bank’s Dale Knotts, right. The Linton-Stockton Chamber of Commerce held their annual dinner and awards banquet Thursday evening at the Elks Lodge in Linton to announce their Citizens of the Year, Jeff and Vickie Doris and Business of the Year, Pleasant Grove Farm and Pleasant Grove Inn for 2018. Past Citizen of the Year recipients include David and Becky Reed, Mark and Joanne Stacy, Jonas Uland, Bob Bradford and Jimmie K. Wright. Criteria for this category includes good deeds that have made an extraordinary impact on the community. Jeff Doris, who said being named along with his wife as Citizen of the Year was a surprise. Vickie Doris could not attend, as their daughter, who attends Bloomfield High School, had an event scheduled that evening that she had promised to attend. “This was completely unexpected,” Doris said. “Definitely unsolicited and possibly undeserved.” Doris, who was the driving force behind the restoration of the Cine Theater as well as Main Street Gifts and other buildings on Main Street, recalled a conversation he had with the former Mayor of Linton, the late Tom Jones. Past Business of the Year recipients include Linton VFW Post 7118, the Greene County Daily World, Greene County General Hospital and Glenburn Home. Criteria for this award is significant accomplishments, including growth, response to adversity, community involvement and innovation. By Shad Cox Pleasant Grove Farm was named the Linton-Stockton Chamber Business of the Year 2019. Pleasant Grove owner John Cline was ill so the award was accepted by Cline’s daughter and son-in-law, Kenneth and Deidra Dowling. Pleasant Grove Farm Owner John Cline, battling an illness, also could not attend. Accepting the award in his stead were Cline’s daughter and son-in-law, Deidra and Kenneth Dowling. By Shad Cox The evening's guest speaker, Jack Klemeyrer. The evenings guest speaker was Jack Klemeyer, a veteran business coach, consultant and featured speaker. 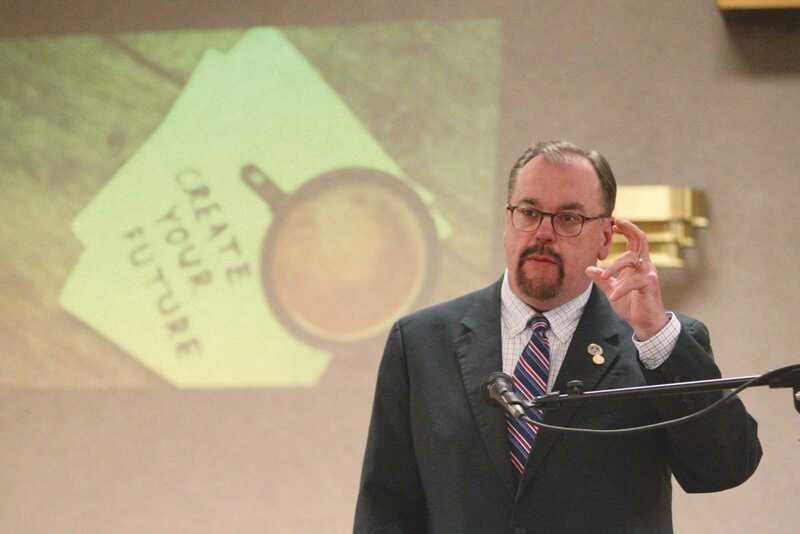 Klemeyer is the founder of Grow Your Business Coaching, a company specializing in helping solopreneurs and microbusinesses attract more clients, grow their business and live the prosperous life they deserve. Klemeyer grew up around a passionate entrepreneur, his father, so he understands firsthand the struggles of the small business owner.